Why is there a 3 years gap between your Endukante Premanta and Ganesh? For the first time in my career spanning 26 years as a producer, I have got a gap of 3 years between my releases. We were to make a film in Surender Reddy’s direction and we had worked on that script for over an year. We had muhurat of the film as well. But at a later point of time, we had certain creative differences and decided that we should shelve the project with mutual consent. Basically the project of Endukante Premanta was supposed to be done by Paruchuri Prasad (Simha producer). He signed in Karunakaran and Ram. After some time, he realized that the estimated budget could be way above what Ram’s market can absorb. I endorsed his opinion and decided to make the movie on my banner. Me and Ram felt that we should do this project at any cost as this script has the potential to be made as a bilingual (Telugu and Tamil). We shot the each scene of the film two times (one for Telugu and one for Tamil). We have started the shoot in the month end of July 2011 and the movie getting released in 10 months after the start of the shoot. This film is shot in an uncompromising style. We had shot the movie in Paris and Geneva for 35 days in October and November months continuously. We wanted to capture the nature beauty in fall season. Endukante Premanta shows about how far a guy can go for the sake of his love. He has worked on the script for over an year. He has done tremendous home work. Whenever I had a doubt about a particular scene, he tells me what he has gone through to arrive at that scene. Karunakaran is a kind of director who acts and shows. Hence it’s very easy for the actors to pick up and perform. How different is Ram compared to his earlier films? He became a better actor with this movie. There is an advantage for the actors who work with Karunakaran. Ram has improved a lot in emotional scenes. Ram’s comedy timing got perfected when he worked with Seenu Vytla for Ready. These are the kind of directors who enrich the prowess of actors they work with. Ram stopped shooting of a song to learn gymnastics for two months and then resumed the shoot of that song. That is the kind of dedication Ram has towards his work. Tell us about Tamanna’s work? The reason why I had taken Tamanna was purely on commercial terms since she is one of the in-demand heroines in Telugu film industry now. But after working with her, I had realised that there is a great actress in her. Her performance towards climax reminded me of Soundarya. I am very sure that Tamanna is going to have a long-lasting career in Telugu film industry. How many days this film is shot for? 118 days. This number is more than what we had budgeted for. Ram’s debut film Devadas was shot in 190 working days and his second film Jagadam was shot in 210 working days. You have seen the final copy of Endukante Premanta. What is your gut feel? Karunakaran’s presentation with strong story telling is going to be the winner for this film. The humor in the movie is subtle. Whenever I see you before releases, I observe that you are calm and tension-free. What is the secret? I have produced over 29 films so far. But, I have managed table profits (profit before release) for only two movies - Mavi Chiguru and Nuvvu Naaku Nachav. I always make sure that I put my best efforts while making movies. The result is not in our hands. There is no point in being tensed now. Saravanan who made his debut with Ganesh film delivered a universal hit film like Journey. What went wrong with Ganesh? I chose the right director and a wrong subject. That’s where it went wrong. He has given two stories and I picked the wrong one. It was a judgment problem. I am going to produce a film in Saravanan direction in the next year. Tell us about Ram’s projects? Ram is currently doing two films. 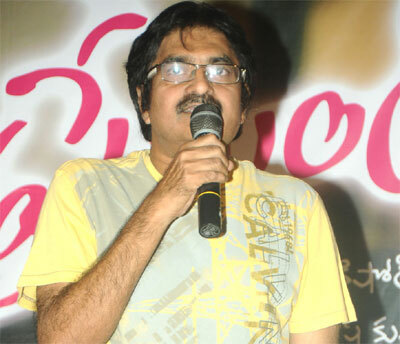 One is in the direction of Bommarillu Bhaskar which is being produced by Bhogavally Prasad. The other is in the direction of Santosh Srinivas which is being produced by Bellamkonda Suresh. I am going to produce another film with Ram in the direction of cinematographer Vijay Milton. This film will be launched in the month of December. Tell us about release of Endukante Premanta? Endukante Premanta has obtained a clean U certificate. We are releasing the film in maximum number of theaters for Ram as it is following a hit film Kandireega. The exhibition medium is slowly changing from physical prints to digital prints. The physical prints of Endukante Premanta are below 30. I am hoping for an increase in Ram’s overseas market as the subject will click really well with the overseas crowds.